Small businesses have led the way to recovery in every recession. Today, 80% say they use social media for business, but only 57% have a strategy; that’s based on 2,200 interviews of small business owners according to Business Journal. Behind every big idea there’s sure to be a strategy so, to narrow the gap, here are 5 big social media ideas for small businesses. 1. TO BUILD IT IS BETTER THAN TO BUY IT: That’s the strategy Melrose Jewelers followed when the ran a quiz on Facebook; one that engaged potential customers by revealing the type of high end watch was right for them through a few, fun questions. They also gave consumers $250 off on that watch whose average price was $5,000. 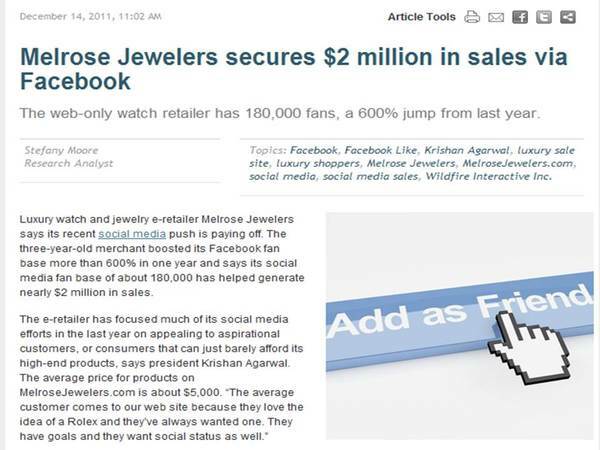 Melrose Jewelers used an app called Wildfire. They could have bought or rented a list of upscale consumers but why. 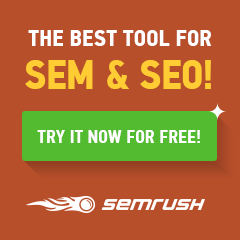 They generated $2,000,000 in sales in one quarter at a fraction of the cost; saw the website traffic go from 50,000/month to 400,000/month and Facebook “Likes” go from 3,000 to 180,000 over the period. The size of their database increased by similar multiples for future marketing initiatives. 2. BELIEVE YOUR PRODUCT IS THE BEST ON THE PLANET: Tom Dickson of Blendtec is a YouTube phenomena. Blendtec has produced roughly a dozen commercials for $1000 each. Some have been viewed over 14,000,000 times. They increased company sales +700% within a year. Take a look at Tom’s passion for his brand and what happened to traffic on the Blendtec website when the commercials starting running. 3. 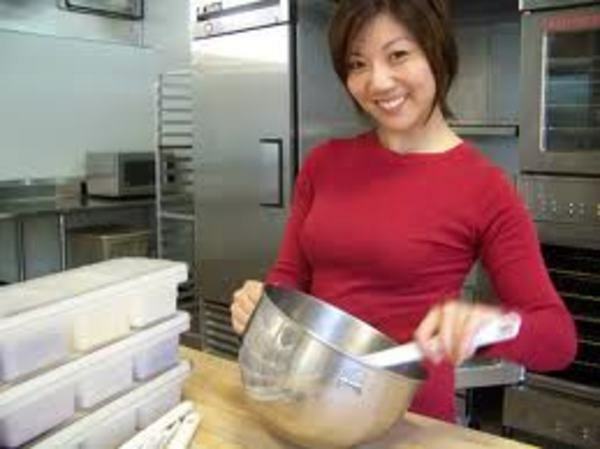 PEOPLE LIKE TO DO BUSINESS WITH PEOPLE THEY KNOW: The idea for Foiled Cupcakes, a company that sell cupcakes online was created when founder, Mari Luangrath, tried to buy her son a dozen gourmet cupcakes for his birthday. In Chicago, that wasn’t possible for under $100. Mari’s model was to lower costs with no store but a website with delivery service. But when the creation of the Foiled Cupcakes website was off-shored and the developer ran into a problem with PayPal, the cupcakes were ready; the website wasn’t. Mari jumped in and started the company with only Foiled Cupcakes Facebook and Twitter pages and a commitment to build 1-to-1 relationships. 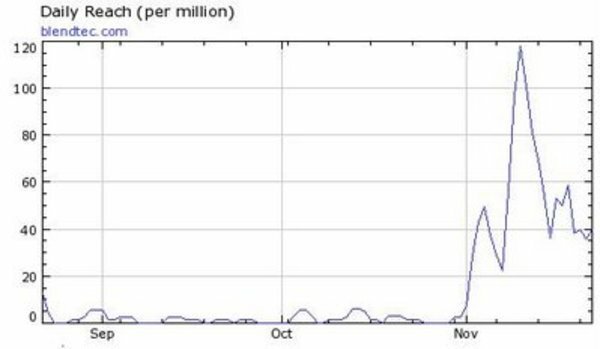 Today, 97% of Foiled Cupcakes’ customers come from social media and the company exceeds forecasts by 600%. Mari now get orders for 40,000 cupcakes proving there is no substitute for effective customer engagement. 4. SOCIAL MEDIA AND CUSTOMER SERVICE ARE THE SAME BUSINESS: After six months of break-even sales and no money for traditional marketing, Joe Sorge, the owner of AJ Bombers, a burger restuarant in Milwaukee, started using Twitter to attract customers. Within a year, weekly sales increased +60%. What happened? Joe jumped into Twitter where 75% of patrons now come from and AJ Bombers has attracted 20,000+ Twitter followers. Here is the AJ Bombers story. 5. CUSTOMERS ARE THE BEST RESOURCE FOR INNOVATION, IDEAS AND ROI: Fiskars is a 300 year old Finnish company that makes fine cutting toosl. 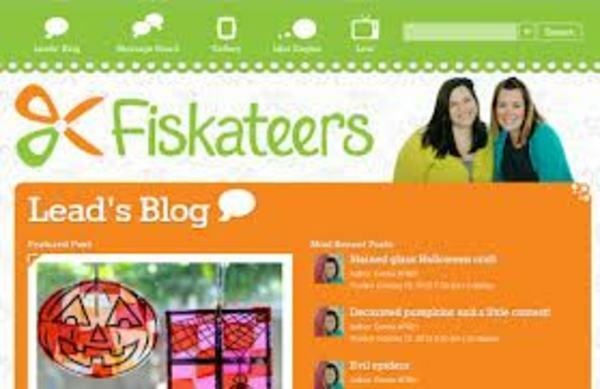 Art and Crafts stores are, for the most part, mom and pop businesess so Fiskars created an online social community of crafting enthusiasts called “Friskateers” to reach underutilized channel of small retailers for a 3X increase in company sales. Plus, the 6,000+ “Fiskateers” are used for innovation and new ideas saving Fiskars significant dollars over traditional market research. These small business stories, as well as many for big business too, are included in the eBook, 166 Case Studies Prove Social Media Marketing ROI, downloadable with just a click on the sidebar of this website. They prove. for every big idea, there’s sure to be a strategy behind it. 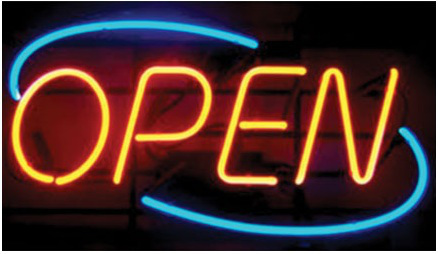 Our heart goes out to small businesses because we are one too. Could ideas and strategies like these help your business? Such a great 5 social ideas. i really happy to read about this……. What businesses need to be mindful of is social media can impact the way you do business, this is why it is important in the digital age to continue to monitor customer feedback, this will be crucial for business progression and survival. Social Media is a great platform to grow your business.Now a days most of people use social media network to promote their product and it also helps to make the company as brand. Nice tips for promoting our business. I really happy with your tips. it is very useful tips for me. Absolutely worth reading this post… To improve my small business condition I’m being utilizing Facebook, Twitter and Digg social networks so often and so far these places never failed me. Thanks.